This is the ninth chapter of The Architects Guide to Choosing the Right Carpet. The actual process of selecting carpet for a hospitality project is much the same as outlined in a previous blogpost about office environments. However, the design emphasis is entirely different. Hotels, restaurants, bars, clubs and other hospitality venues are, after all, where people go to get away from the workaday world, to relax, socialise, indulge and have fun. Each project needs to be a unique experience, with its own special ambiance that attracts its intended target market. Each project needs to be a unique experience, with its own special ambiance that attracts its intended target market. 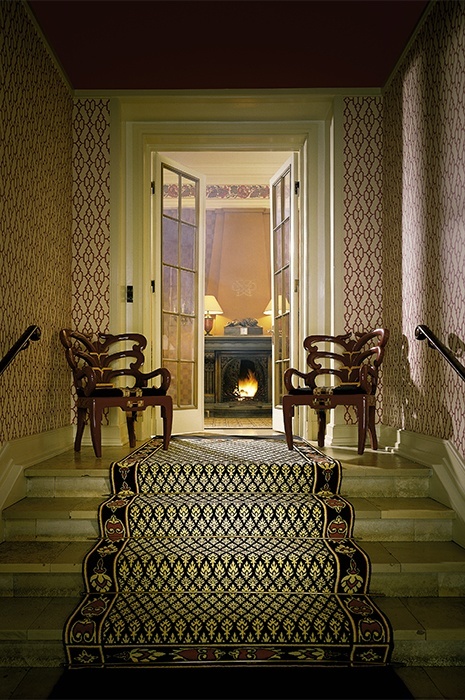 There’s nothing quite like the subdued hush of entering the lobby of a well-designed five-star hotel or the entrance to a silver service restaurant. It should whisper immediately of luxury and exclusivity like the one created by a high quality custom wall to wall carpet. The immediate sense of luxury and beauty is further amplified by the plush textures and comfort underfoot, as well as the soft ambience created by acoustic carpet backing that is essential for hospitality projects where there will be traffic 24/7 and an expectation of quiet relaxation. Seamless, large-scale patterning, subtle texturing and complicated constructions and design elements are all possible with high end wall to wall carpet, plus exceptional flexibility in customisation of pattern and colour. Working closely with a custom carpet company, it’s possible to create a truly unique experience in any high end hospitality environment for the visual, tactile and sensual pleasure of customers and guests. 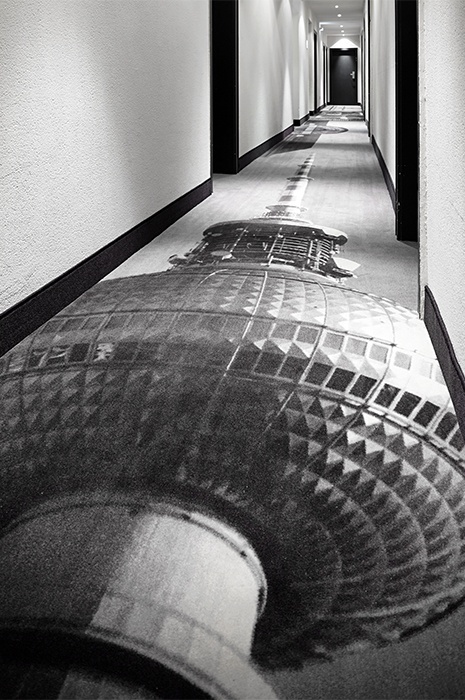 With a quality custom carpet company, it is even possible to order custom designs in runs as small as 4 x 4 metres, enabling individualisation of every guest room in a boutique hotel. For mid-range projects, with more limited budgets, it’s possible to make lavish use of wall to wall in lobbies and other public areas, while using more cost-effective carpet tiles or standard wall to wall in areas such as corridors and guest rooms. For the ultimate luxury effect, we recommend that you choose quality wall to wall carpet in high density, heavier weight, high lustre and cut-loop. 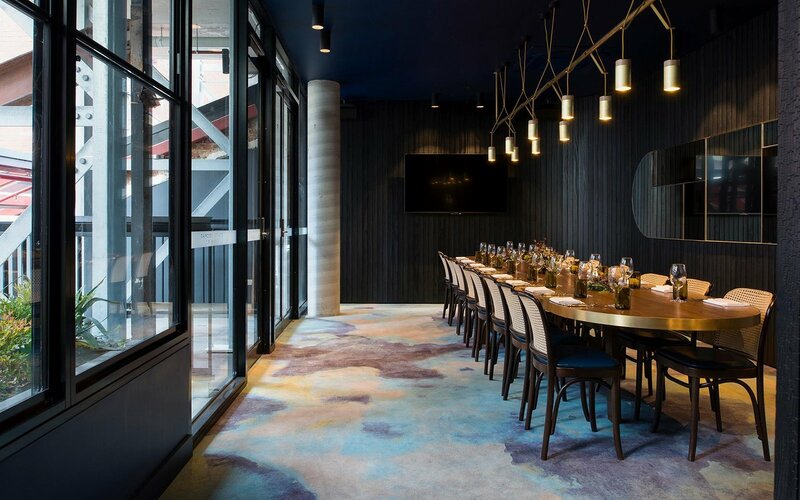 As an alternative to wall to wall carpet, versatile and cost-effective carpet tiles are becoming an increasingly popular choice for more casual hospitality spaces such as bistros, pubs and clubs. Providing that you choose the proper backing, carpet tiles can have all or most of the acoustic effect of a wall to wall carpet, dampening the noise levels in places where people gather and chatter socially. 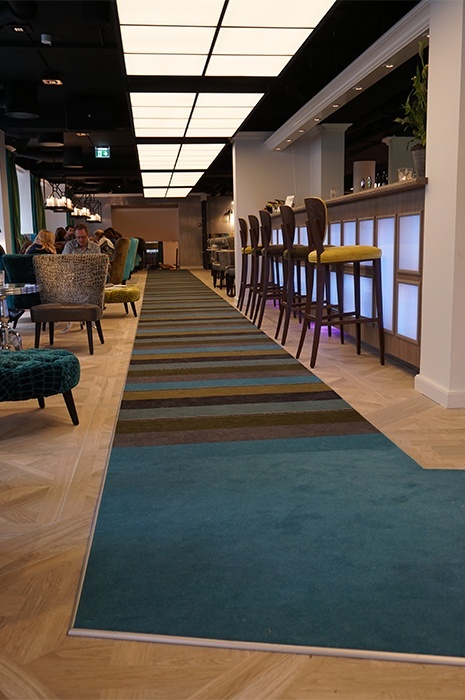 As an alternative to wall to wall carpet, versatile and cost-effective carpet tiles are becoming an increasingly popular choice for more casual hospitality spaces such as bistros, pubs and clubs. They also offer the practical ability to order extra stock for replacement of tiles when needed, which is considerably easier than replacing sections of wall to wall carpet. Available in a range of sizes and shapes including square, plank and hexagon, carpet tiles offer much greater design flexibility today than in the past and, of course, the opportunity of custom colour and pattern further widen the design options. 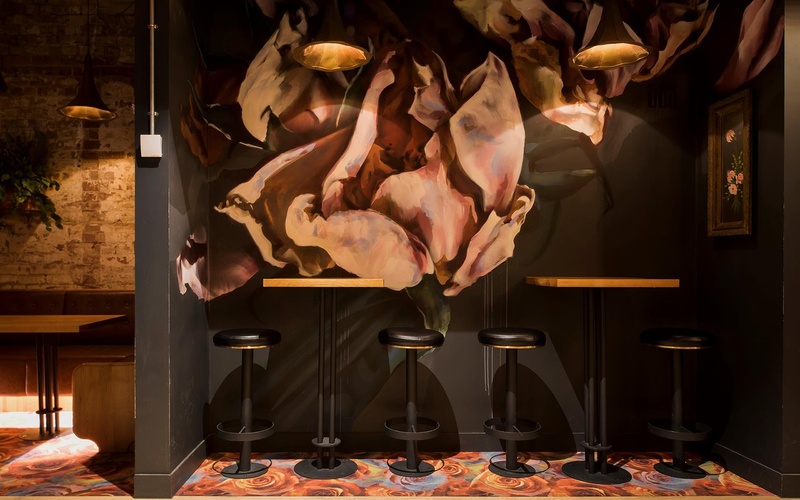 Take inspiration for your next hospitality project from the amazing examples featured in this blogpost, where the comfort, texture and warmth of carpet have been used to stunning effect and custom colours and designs used to create spaces of individuality and great atmosphere. Finally in our next blogpost, we´ll take a comprehensive look at carpet properties, certifications and classifications – all you need to know to choose the right type of carpet for every end use and achieve great results.